Hanayama Cast Shift - these are really hard to photograph! はずす: "huh-zu-su" means 'to take apart' in Japanese, and puzzle is written ぱずる　(pronounced "puh-zu-ru"). 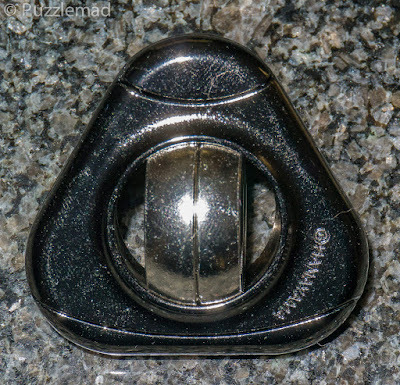 Hanayama combined the two words together to make up a portmanteau that describes a puzzle you take apart. The most recent one is the Cast Shift which I actually think should be called the Cast Hashtag because that's exactly what it looks like. 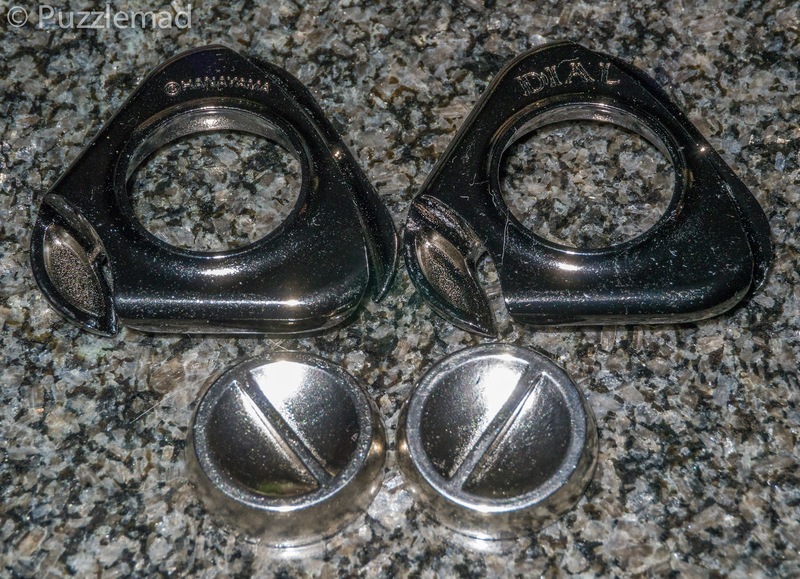 It consists of 4 nice shiny chrome board burr pieces which are interlocked alternating up and down with the name and the Hanayama copyright on the pieces. The puzzle is 4 x 4 x 3.5 cm and a very nice heft. The packaging states that it is level 3 out of their scale of 1 to 6 which should make it a small challenge but not terribly tough. I personally would put it at a level 2. Looks like a board burr but isn't. I was pretty confident that I understood it and scrambled the pieces (there are only 2 types) and left it a while. It is a bit fiddly working out the correct orientation to put it back together and there is actually 2 conformations that can be assembled but the difference between them is fairly trivial. It does require the pieces to be placed just so for it to be reassembled but if you have taken it apart then it should not take long. Do I like it? Of course I do! It is NOT a huge challenge for a puzzler who has been at it for a few years but has that nice Aha! moment and is a pleasant diversion rather than a big challenge. It certainly will look nice on display and will be perfect to handout to non-puzzling friends. It will keep them occupied a little while without overly frustrating them. Certainly for the low price (£10/€12/$15) this whole series cannot be beaten. Buy it as soon as it becomes available in your region! Cast Dial - even harder to photograph! I'm too lazy to get my light tent out! 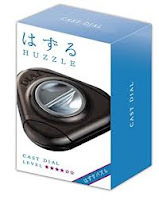 Next up is the Cast Dial which was released about 6 weeks ago (these are now coming available outside Japan - PuzzleMaster & UK store). 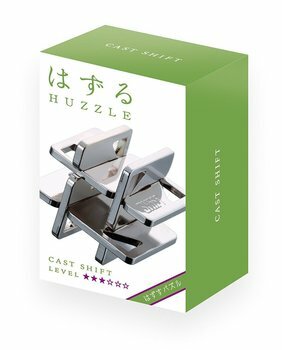 Mine arrived in the rather nice Japanese packaging and according to the PuzzleMaster page there is a non Japan packaging which looks very different with no mention of the word Huzzle which I think is a shame. It was designed by the very prolific and hugely talented Vesa Timonen. The aim is to separate all 4 pieces. The difficulty level is 4 out of 6 (or for PuzzleMaster level 8 on their scale of 5-10). My picture does not do it justice as this puzzle is stunning to look at with the triangular outer pieces being a wonderful black anodised metal with the word dial etched using an outline font rather than just stamped letters. 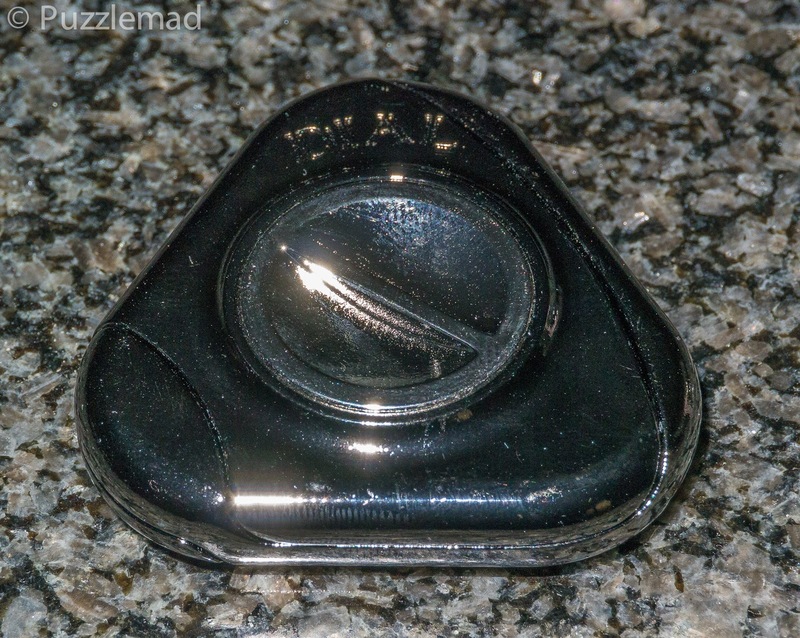 The inner pieces with the dial are a nice chrome finish. 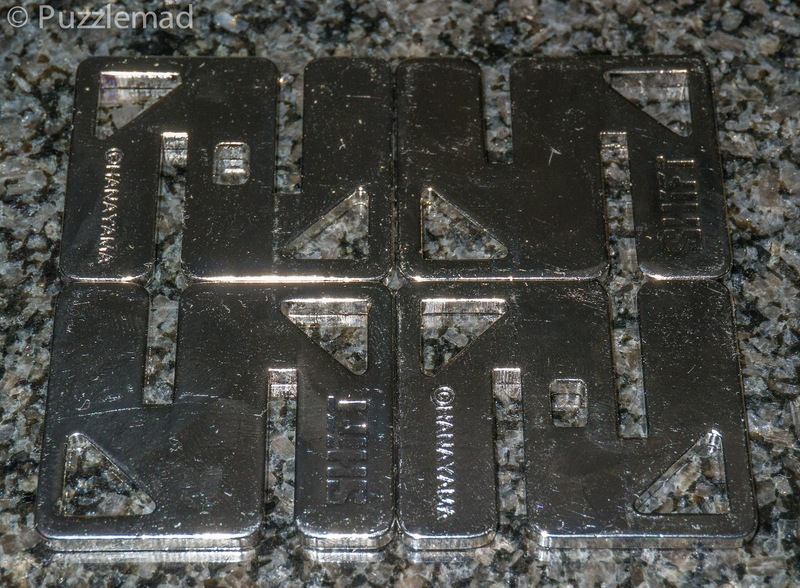 It is wonderfully tactile and in size is 5.5 x 5.0 x 1.2cm. 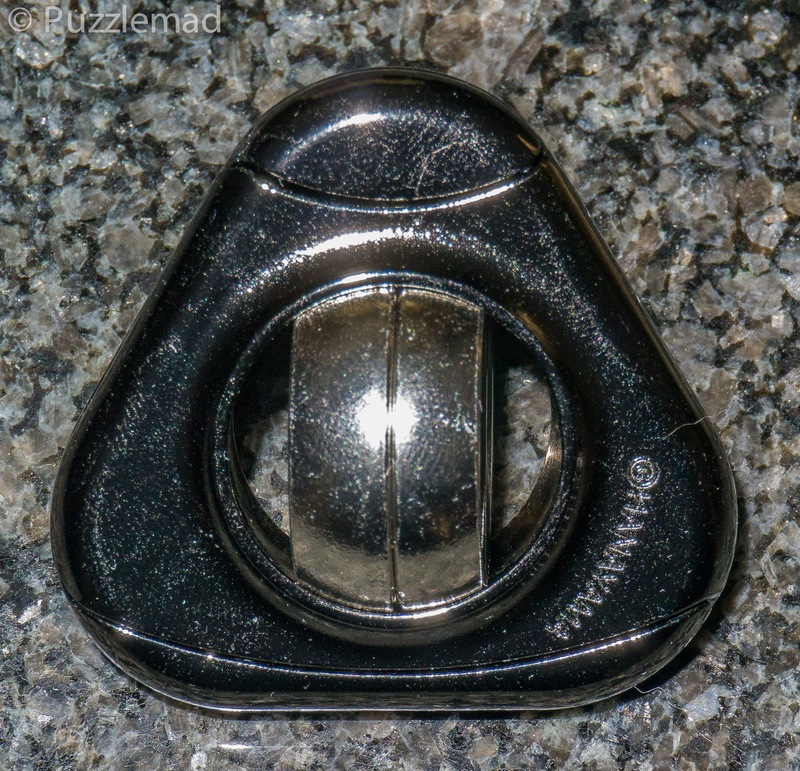 The first thing you notice is that the outer triangular parts are a fairly complex construction and will not slide at all because the inner dials are preventing any movement. hen it becomes apparent that the dial can rotate freely within the triangle and that the two dials can turn independently of each other. This alone gives enough of a clue to get any reasonable seasoned puzzler started with a plan of what to do and at this point he will realise the one MAJOR problem with this puzzle.... it is just TOO small and fiddly. Before I even started on it I was forewarned by my friend Michel van Ipenburg (a very well known and talented puzzler) that I would come to think that my fingers were too large and I didn't immediately understand. But as soon as I started to try to solve it rather than just manipulate it to take photo, I realised the problem. It is beautiful and feels great but it is also slippery and the parts that one needs to grip are really small and hard to hold. This problem seriously detracts from the enjoyment of the puzzle! Mrs S actually laughed at me over the 2 evenings that I was solving and working out the exact sequence of moves. I spent most of the time effing and blinding and dropping the damn thing because it kept falling on the cat on my lap due to being unable to keep a decent grip on it (and I have fairly small hands). Once it is apart there is a very nice Aha! moment as you retrospectively realise what you have done. 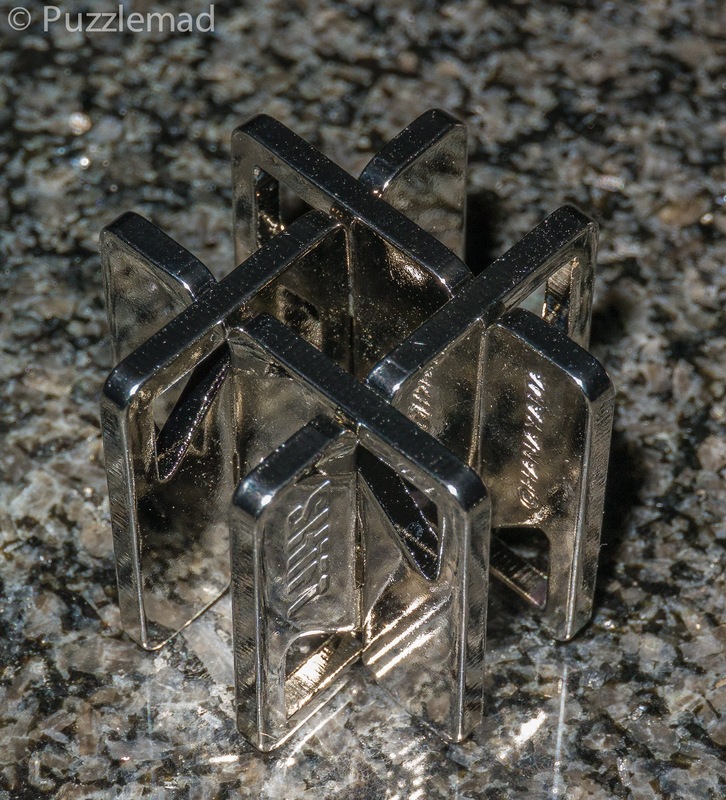 It is VERY ingenious and impossible to deduce from the closed puzzle. The next part (and the real challenge) is to deduce from the separated pieces how to put it back together again and especially the exact sequence to dismantle it without using lots of random moves. I am not terribly bright (as you all know) and I spent a long time with those two dials and really struggled to find a nice sequence - sometimes things just got caught up. Only when I had a really close look at the inner construction did I finally understand the true genius of Vesa - there is a very subtle thing to notice and then work with before true understanding occurs. I actually agree with the difficulty level of 4/6 as it is solvable in an evening but true understanding takes a little longer. Do I recommend the Cast Dial? Yes but with reservations. It is VERY clever and true understanding comes with a nice couple of Aha! moments BUT it is just so darned hard to hold and manipulate and that really detracts from the enjoyment. I would say that this is best for serious puzzlers but we all know that you are all going to buy it anyway! PuzzleMaster have them in stock now and I am sure that Sloyd, Hendrik, UK Hanayama and MrPuzzle will get them soon. At such a low price they shouldn't be missed. Thanks Hendrik for giving me the chance to buy these puzzles early! Boy, these cast puzzles seem to come out faster and faster. Hard to keep up! Glad they didn't do the silver and gold thing on Shift. It's very hard to keep up! Especially when you factor in all the other puzzles that we keep buying!